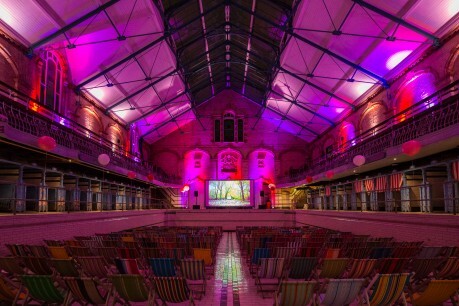 Whether you’re single or coupled up, curling up with your loved ones in front of an all-time classic movie is the perfect winter warmer and The Village Screen pop-up cinema will be transforming Victoria Baths into a charming, candlelit cinema this February for a romantic line up, alongside fantastic street food traders and entertainment. The Edwardian grandeur of Manchester’s Water Palace will be the backdrop for enjoying these romantic films at their best, on the big screen! The Gala Pool with its period detailing and ornate tiles make a stunning setting for a memorable treat to enjoy with your loved ones or friends. Audience members will be seated on cute, candy-striped deckchairs inside the Gala Pool to watch the films or on wooden seating overlooking the Gala Pool on the Balcony level. This dreamy weekend kicks off on Friday 15th February with a screening of Baz Luhrmann’s uber cool masterpiece, Romeo & Juliet. Set in the modern-day city of Verona Beach, the Montagues and Capulets are two feuding families, who children meet and fall in love. It is the classic story of two star crossed lovers but never was there a story of more woe than of Juliet and her Romeo. On Saturday 16th February in the afternoon we have a screening suitable for families - Disney's animated musical classic - The Little Mermaid. And for Saturday 16th February in the evening we have a screening of 90's rom-com 10 Things I Hate About You.